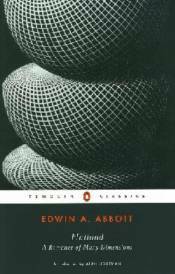 A 'romance of many dimensions' that has fascinated generations of readers with its clever blend of social satire and mathematical theory, the Penguin Classics edition of Edwin A. Abbott's Flatland introduction by Alan Lightman. A work that continues to pose provocative questions about perception and reality, Flatland is a brilliant parody of Victorian society where all existence is limited to length and breadth - its inhabitants unable even to imagine a third dimension. The amiable narrator, A Square, provides an overview of this fantastic world - its physics and metaphysics, its history, customs and religious beliefs. But when a strange visitor mysteriously appears and transports the incredulous Flatlander to the Land of Three Dimensions, his world view is forever shattered. Written more than a century ago, Flatland conceals within its brilliant parody of Victorian society speculations about the universe that resonate in Einstein's theory of relativity as well as the current 'string-theory' of nature. Edwin A. Abbott (1838-1926) was a leading scholar and theologian of the Victorian era. If you enjoyed Flatland you may like H.G. Wells's The Sleeper Awakes, also available in Penguin Classics. %%%A 'romance of many dimensions' that has fascinated generations of readers with its clever blend of social satire and mathematical theory, the Penguin Classics edition of Edwin A. Abbott's Flatland introduction by Alan Lightman.